Today is day one of a 3 day contest. All our Halloween costumes represent a movie. We will give you the year the movie was released as a hint, in parentheses. Some are easier than others. Also, no cats were harmed, I on the other hand, have a few scratches. Sammy was not thrilled with the pom poms 🙂 Put your guesses in the comments and whoever has the most correct over three days will win a prize. You have until Tuesday at 9PM ( EST) to answer. If there is a tie , we will have a drawing for the winner-Good luck! Gremmie wanted to join in the fun too, and he isn’t representing Gremlins. ( 1982). Please come back tomorrow for the next 5. 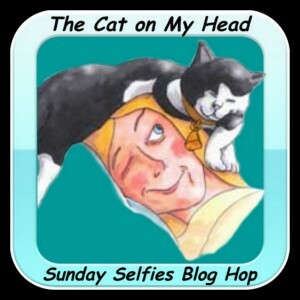 This entry was posted in Blog Hops, Fun and games and tagged contest, Emmy, Gremmie, Joanie, Prancie, Sammy, The Cat on My Head Sunday Selfies Blog Hop by pilch92. Bookmark the permalink. My human isn’t a big movie watcher, except for films made before 1930, but she knew a couple of these! Prancie’s is A Street Cat Named Bob, and Joanie is Ghostbusters. Sorry I didn’t do any old movies. Aww, they all look really grand, though besides the first one, which we think is ‘A Street Cat named Bob’ we haven’t a clue. Still I know there are folks out there far more adept than Mrs H, who is sooo old she says she met Humphrey Bogart, on set, and it is true, he was in black and white! Well that is a fun game. I guessed Ghostbusters for Joanie. The rest we don’t know. What a fun thing to do. Agreeing with Margaret, all i get is Ghostbusters, unless Gremmie is doing The Pirate Movie. Thanks for guessing, we will tell all on Halloween! Well, let’s see: Prancie is “Streetcat Named Bob”, Sammy is “Bring It On”, Emmy is “Runaway Bride”, Joanie is “Ghostbusters” and Gremmie is “The Pirate Movie” ! They all look absolutely ADORABLE. We don’t watch too many movies but those are cute, cute, cute! OH wow, great selfies. We don’t watch movies very much. Carry likes to binge watch TV shows instead, so we don’t know any of these! Maybe next year we will do tv shows 🙂 XO nd love to you too! We don’t watch movies either so we don’t know but it looks like some have figured out the movies. Thank you. Happy Halloween to you too! Everyone is looking cute in their costumes. These are tough. We guess… Joanie is Ghostbusters. Sammy is Bring it On. Emmy is Runaway Bride. You are braver than me! No kitties in costumes in our house. No way. ~grin~ Be well! I can’t think of a thing cause I never go to movie or watch TV much. I am the weirdest mom in town. But everyone looked so adorable in their costumes. Seriously. We’re pretty sure Joanie is Ghostbusters. And at first we thought Prancie was Harry Potter until we saw the date. Not a big movie watcher here either but Prancie, you are adorable as Bob! Oh My, they are so cute. Prancie is a Street Cat named Bob. Joanie is Ghostbusters… that is all I know. Oh, dear…no guessing going to be happening here.Petcretary hardly ever sees any movies, let alone enough to be able to guess yours. She only knows about movies from hearing about them from others…lame eh? MOL! Ask her about classical music and she could keep you busy for a long time, MOL!! Hope you have lots of good guessers and we enjoyed seeing your entries today. Sorry you got to feel some claws. We’re changing our guess on Gremmie – we say he’s doing First Blood (Rambo)! Wow ! your costumes are great ! Unfortunately we don’t celebrate Halloween here in our town. And my cats don’t like to be dressed, lol ! We were going to say Gremlins for the last one but obviously it isn’t that. My mind is drawing a blank. But I do love the costumes! We don’t watch a lot of movies, though we used to watch more. Joanie is Ghost Busters, and that’s the only one we know! Fun idea! I’ll try top to bottom: Harry Potter, High School Musical, 4 Weddings and a Funeral, Ghost Busters and Gremlins. You got one right 🙂 Thank you for playing. Sorry y’all, no costume-wearing for this old gal! This is such fun! I really enjoy watching movies, but I’m pretty sure I haven’t seen all of the ones here. I know for certain that Joanie is living up Ghostbusters here. Though I’m pretty sure Prancie is all about A Street Cat Named Bob, I was really tempted to say Harry Potter given the colors of her adorable scarf. I wish my kitties were as willing to wear costumes as your cuties are! Prancie is Streetcat Named Bob, Gremmie is ET, Joanie is Ghostbusters. Not sure, is Emmy doing the Runaway Bride? Well, I know the first one is Street Cat Bob. And Ghostbusters is easy. But not sure on the others! Love all the costumes, though. You were correct on those 🙂 Thank you.